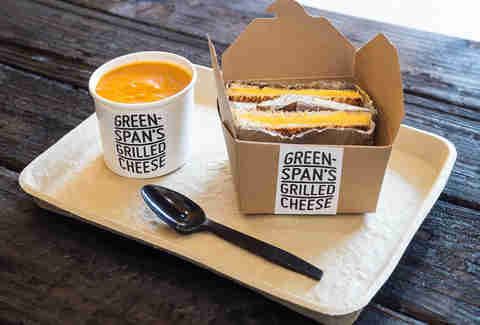 The award-winning sandwich shop Greenspan’s offers every kind of grilled-cheese sandwich you can think of, or you can make your own with their selection of bread, cheese, vegetables, spreads, meats, or sweets. But, sometimes you just want a simple, greasy grilled-cheese sandwich, which is where the Classic -- plain white bread and American cheese -- comes in. Obviously, you have to add a cup of tomato basil soup (extra $3) for that heavy dipping action. Any sandwich shop with this many delicious options under seven bucks deserves your attention -- especially because its chef is Top Chef-winner Michael Voltaggio. Their cold fried chicken sandwich is the runaway winner, though, with crispy fried chicken, ranch cheese, and hot sauce will warm your soul (and your wallet). 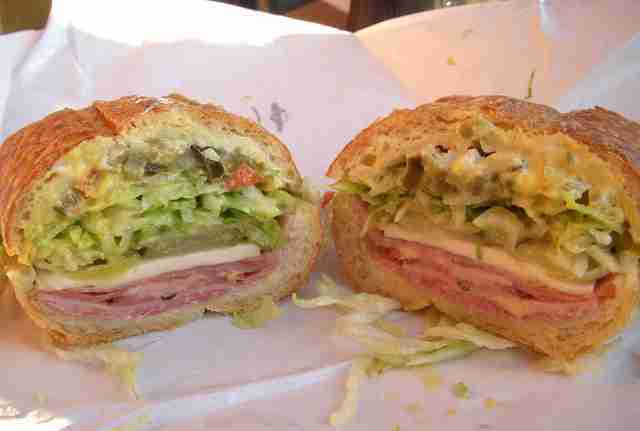 Consider this family-run, hole-in-the-wall sandwich shop the Valley’s version of Bay Cities, and this Classic Italian & Cheese sub (with mortadella, cotto salami, dry salami, and bologna drizzled with their Italian sauce) their Godmother. Speaking of, The Godmother is basically an LA rite of passage. 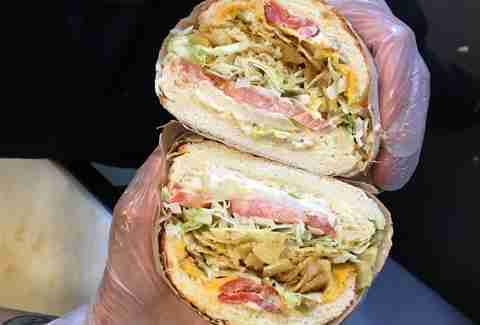 It’s what sandwich dreams are made of. Perfectly sliced genoa salami, mortadella coppacola, ham, prosciutto, and provolone are stuffed inside their freshly baked bread, which, let’s be honest, you’ll probably end up eating a whole loaf of later. 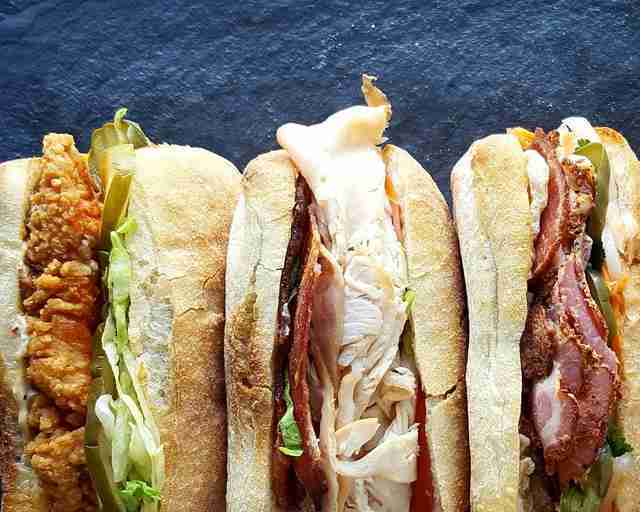 Their special sauce oozes out from every corner and their tissue-paper-thin napkins won’t clean up the inevitable mess you’ll make, but that’s ok: you’ll be in sandwich heaven. Eggs and a brioche bun sounds super-simple, but no one does egg sandwiches better than this beloved Grand Central Market stand. The egg salad sandwich comes with a dash of chives in honey mustard aioli and arugula, sandwiched between their freshly baked buns. What’s that? You put chips in your sandwich? Yeah, well you’re not the first to come up with that genius idea. This vegetarian-friendly sandwich is basically a colossal bite of crunch. Jalapeño potato chips, their secret garlic Dirty Sauce, and American cheese piled high on their insanely good Dutch crunch bread. We’re not exactly sure how a sandwich this good is less than four bucks -- and we’re not sure we want to. The grilled pork sandwich packs a ton of flavor with lemongrass and garlic as well as green onion and crushed peanuts; the pro tip is that you only get one pack of Sriracha on the house, so you gotta make it count. This turkey on baguette looks like it came straight from a Parisian cafe without the Parisian price tag. It’s got all the right ingredients for a picnic sandwich -- swiss Gruyere cheese, sun-dried tomato spread, mixed greens, tomatoes, and crunchy baguette drizzled with extra-virgin olive oil and balsamic vinegar. 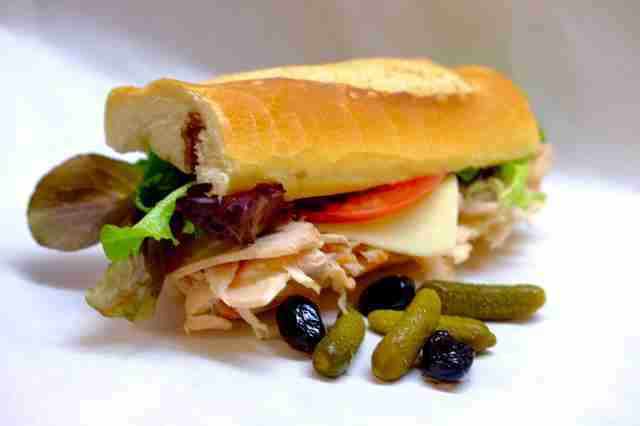 Skip the chips -- every sandwich comes with a side of cornichons and olives to satisfy your salty fix. Tongue sandwich? Yep, you heard right. The small shop tucked away in a courtyard serves up authentic Persian cuisine like kabob and osh soup, but their sandwiches are what they’re known for. And while you can get most of their half-sandwiches like kuku or kotlet for under $6, the tongue sandwich is by far the tastiest. 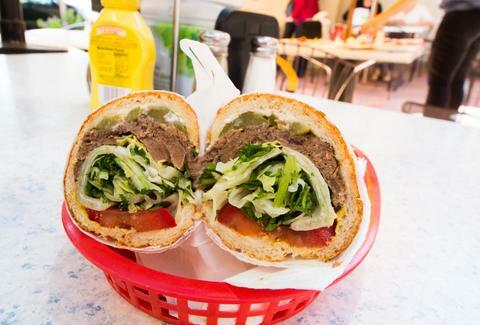 Juicy, tender layers of beef tongue tightly packed into French bread with tomatoes, lettuce, and Persian pickles topped with mayo and mustard. Leila Najafi is always on the search for cheap eats. Got one of your own? Share it with her on Instagram or Twitter @LeilasList.